Sunrise over a Georgia marsh as we conclude black rail surveys for the day. 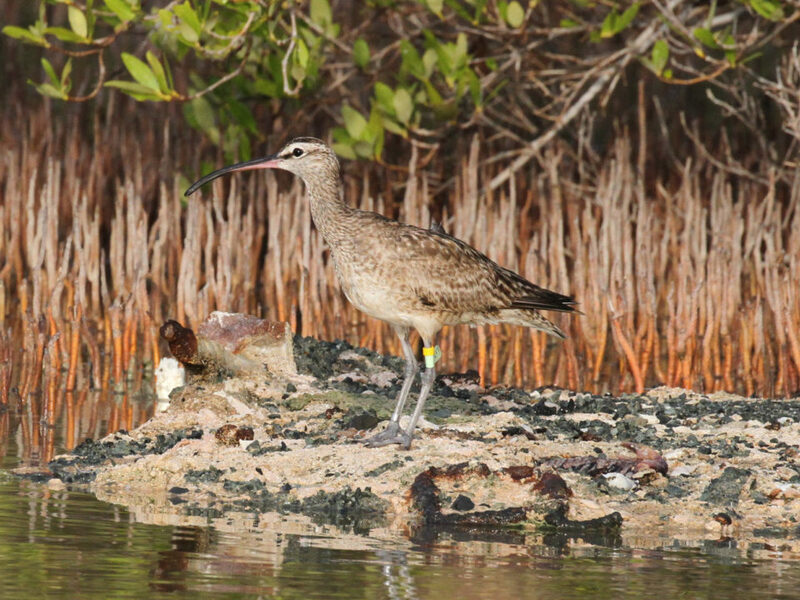 Many sites were surveyed through the night by boat in difficult conditions. Surveys were conducted by boat, ATV, UTV, 4x4 vehicle, and by foot. The eastern black rail is listed as endangered in six states and is currently under review for federal listing. In 2016, The Center for Conservation Biology worked with many partners to produce a status assessment in support of the federal process. Among other things, this assessment identified gaps in survey coverage. 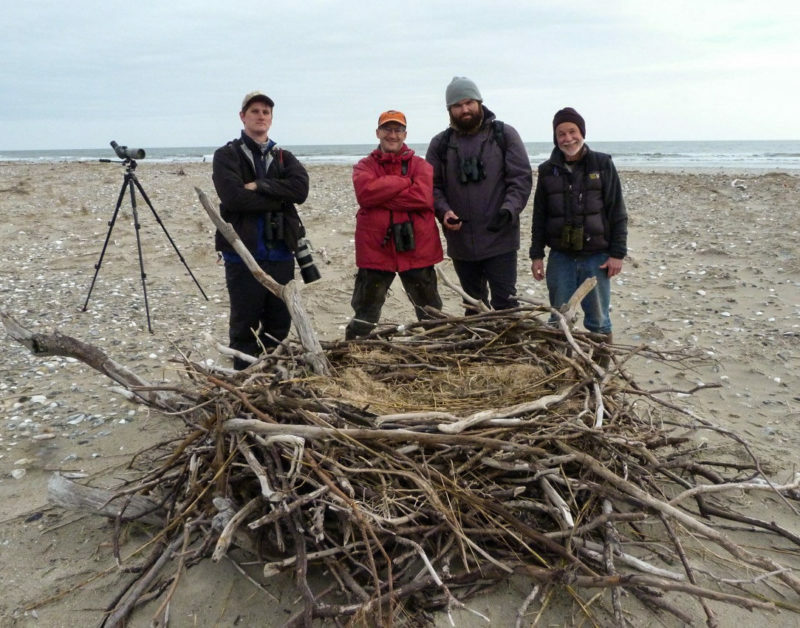 During the 2017 breeding season, CCB worked with the North Carolina Department of Natural and Cultural Resources and the Georgia Department of Natural Resources to help fill information gaps within the two coastal states. 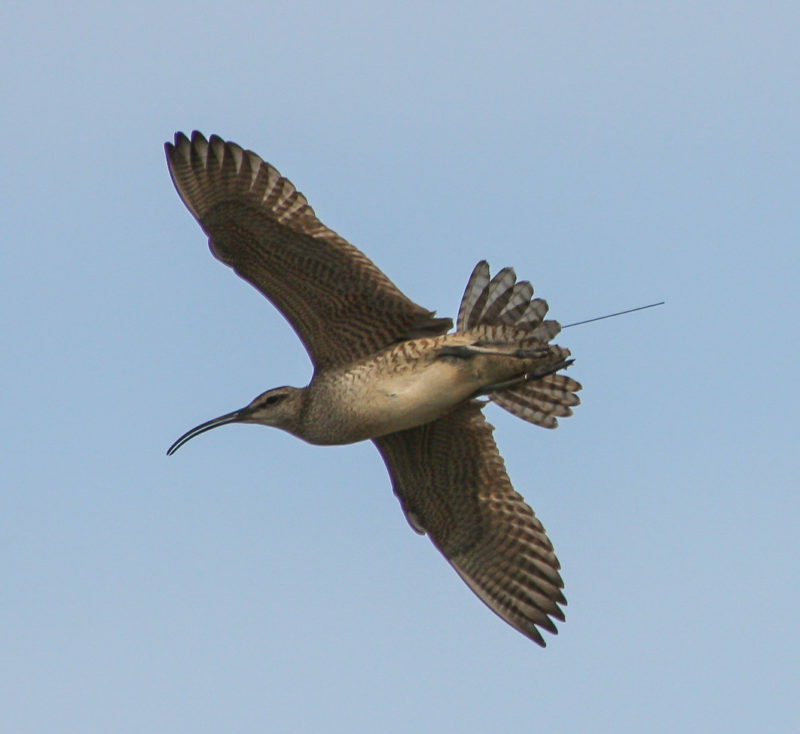 Survey teams were deployed in both states to survey a network of sites within designated high-priority areas and assess black rail occurrence during the breeding season. The surveys continue ongoing efforts by the Eastern Black Rail Working Group to collect information on status and distribution. Since 2014, the partnership has surveyed more than 6,000 locations for black rails within coastal habitats. Sunrise over a Georgia marsh as we conclude black rail surveys for the day. Many sites were surveyed through the night by boat in difficult conditions. 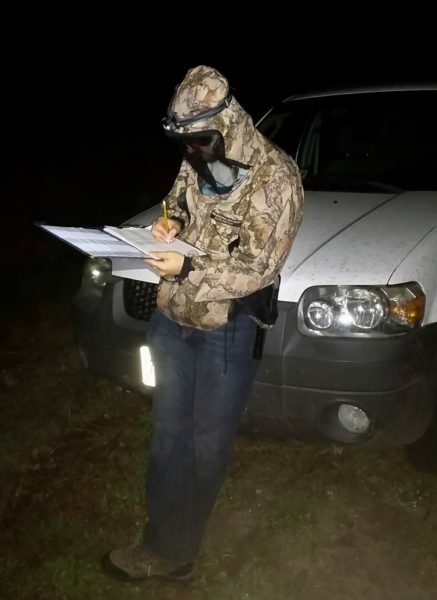 Surveys were conducted by boat, ATV, UTV, 4×4 vehicle, and by foot. Photo by Fletcher Smith. 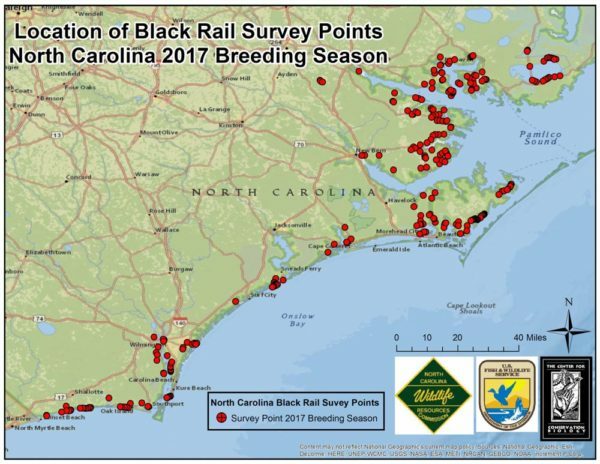 A network of 691 point locations was surveyed for black rails during the 2017 breeding season, including 284 in North Carolina and 409 in Georgia. The network was surveyed three times between 18 April and 21 July using a standard call-back protocol, resulting in the execution of 1,983 point counts. Surveys in North Carolina targeted coastal regions that were not included in the 2014-2015 effort conducted by CCB. The only exception to this was Cedar Island, which has historically been the center of activity in the state. No formal surveys of black rails have been conducted in Georgia so the network covered the entire Coastal Plain in an attempt to determine status and distribution. Map of survey network for coastal North Carolina. Surveys focused on coastal regions of the state that were not covered in the 2014-2015 surveys. Data from CCB. Black rails were detected within only 4 (0.6%) points and during only 5 (0.3%) of the point counts conducted across both states. 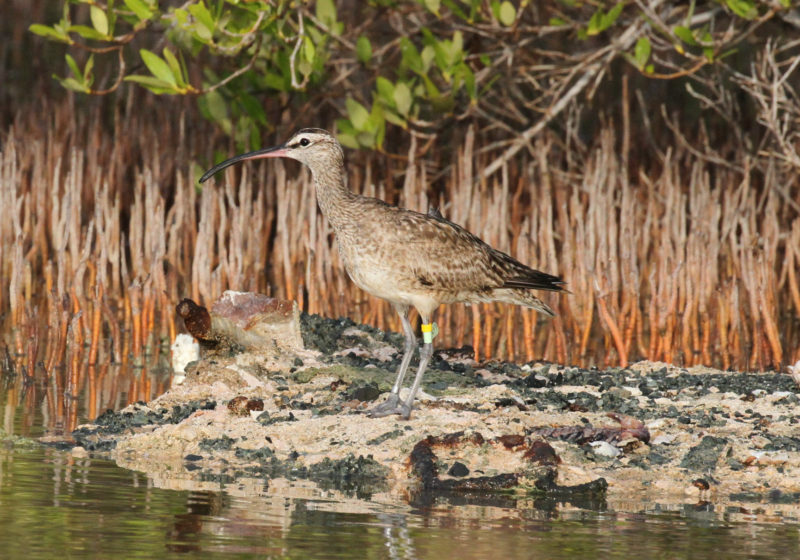 Detections were only made in North Carolina and only on Cedar Island National Wildlife Refuge, an area already known to support these birds. The extensive survey effort resulted in the detection of no new occupied sites. The effort has provided closure to some of the identified information gaps. Map of survey network for coastal Georgia. Surveys focused on high-priority sites along the entire coast of Georgia. Data from CCB. Eric Sibbald records data during a survey along the North Carolina coast. Photo by Rob Colquhoun. Results from the 2017 effort are discouraging and are consistent with observations across much of the Atlantic Coast over the past decade. 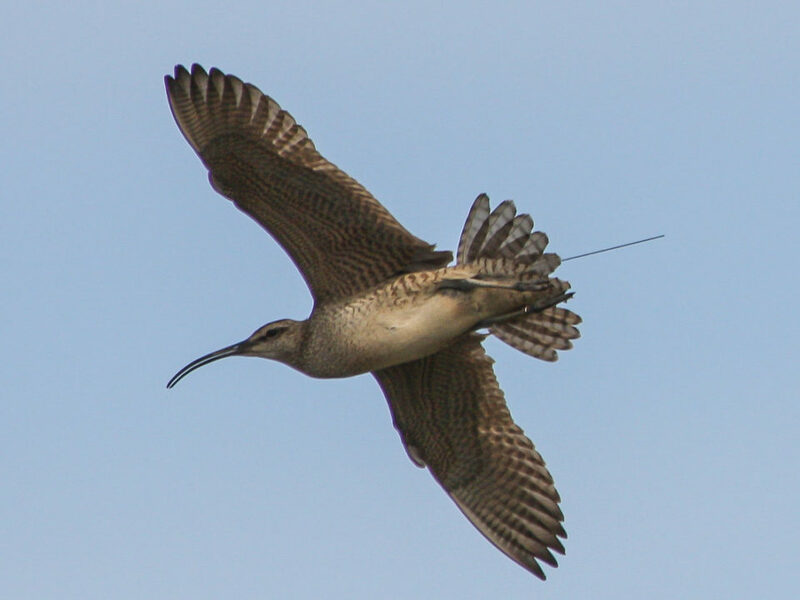 Black rails have experienced a 2014-2015 effort conducted by CCB catastrophic range contraction from northern breeding areas that is progressing southward. 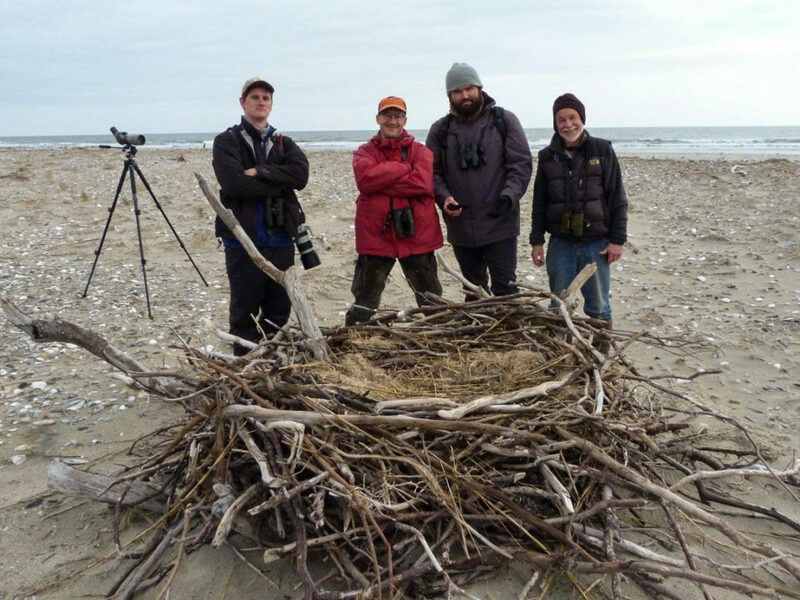 Efforts are continuing within the Eastern Black Rail Working Group and other appropriate committees to identify management options that will stabilize remaining strongholds and slow the ongoing decline. Survey efforts will continue in both North Carolina and Georgia during the 2018 breeding season to fill remaining information gaps.